So the idea for today was to bring together all the lessons from those 28 posts. But since I wrote my previous article, ERN has written posts number 26 and 27 in his series. So we’d better start with those. Article number 26 is called “10 things the makers of the 4% rule don’t want you to know”. We’ve come across most of them before, so we won’t spend too long on this post. It should be called the 4% Rule of Thumb. There’s no such thing as a one-size-fits-all SWR. The 4% Rule is likely to be too conservative for many retirees. Older people with DB pensions are most likely to be able to spend more. In any cohort, the most successful / lucky investors will vastly over-accumulate wealth. The Rule ignores taxes and expenses (commissions etc). Flexibility (of spending / withdrawals) is overrated. In most scenarios, you need to cut back / work a side hustle for many years to survive. Many (simulated) cohorts have a very scary and turbulent ride, even if they eventually succeed. Which bond duration you choose makes a big difference. Long bonds did well in low inflation crashes (the Depression, Dot-com and 2008) but not in the inflationary 1970s. Short bonds did fine in the 1970s. Unfortunately, you can’t know in advance which kind of bonds you will need. Commentators routinely confuse nominal and real numbers. The 2000 cohort is not safe yet. It’s severely underwater in real terms and might not make it to 2030 and beyond. The people who “invented” the 4% Rule won’t need it themselves. They are mostly tenured academics, financial advisors and the richer bloggers. Small-cap and value factors might not work in the future. Historically, they did much better than large-cap growth stocks. That’s it for article 26. Article 27 is about why Accumulation (saving for retirement) is easier than Decumulation (actual retirement, or spending it). It’s a kind of tongue-in-cheek justification for why ERN (and I) are so obsessed with SRWs. Simple, but not easy – saving 50% of your income could never be described as that. ERN comes up with five reasons why decumulation is harder than accumulation. Decumulation has higher stakes than accumulation. Success in accumulation is what you make it – you define your own target. Whereas success in decumulation is simple – not running out of money. Fail to accumulate well enough and you simply face “one more year” (or several) of working and saving. Fail to spend your money properly and you face the prospect of starvation (strictly, some form of welfare in developed countries) or going back to work as an octogenarian. This is really the same point, but ERN looks at it in terms of solutions. Working a few extra years is a lot easier than “dying a few years earlier”. ERN also talks about flexible spending as a crutch in retirement, pointing out that its not as simple (or successful) as many in the FIRE community like to believe. In steady accumulation, you benefit from dollar cost averaging. A crash early in retirement can be so severe that you never recover. Your withdrawals while the market is down will punish you. In accumulation, investment returns and savings contributions pull in the same direction. If one falls short, the other can pull you through. In decumulation – and in particular, under the forms of decumulation where your initial retirement pot will be partially or totally depleted, rather than preserved – your outcome is very sensitive to the SWR that you choose. 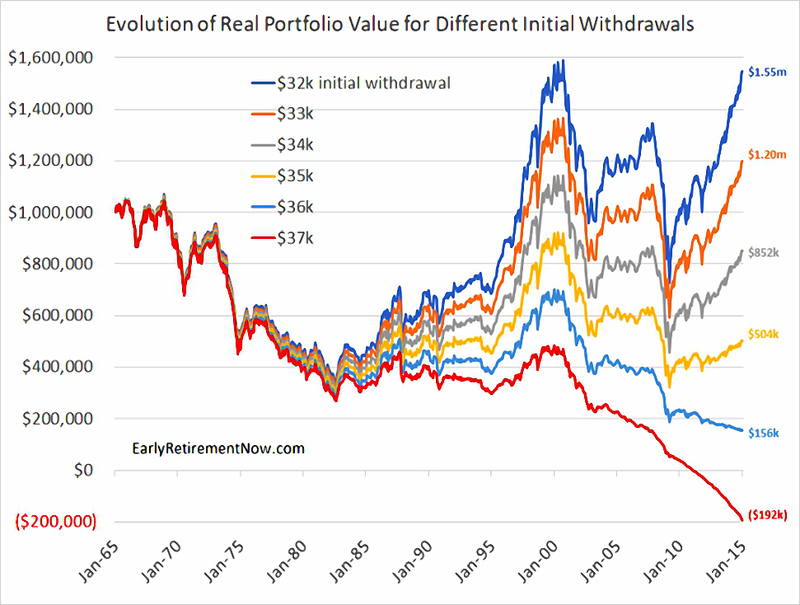 In accumulation, saving 15% more would lead to a final value that is 15% more, not a range of values that covers 170% (of the initial retirement pot). It’s the difference between paddling a canoe upstream versus downstream. ERN notes that over a 45-year accumulation period, compounding does most of the work (86% in the example he uses). For FIRE devotees, with say a 15-year savings horizon, your contributions are more important than your returns. In decumulation, the reverse applies. The longer your retirement horizon, the more reliant you are on compounding. Which means that volatility of returns and sequencing risk make retirement more unpredictable, for FIRE devotees in particular. For me, these two posts are a bit thinner than the main meat of the series. They are a look back at why ERN is so interested in SWRs and how the promoters of the 4% Rule won’t let it go. 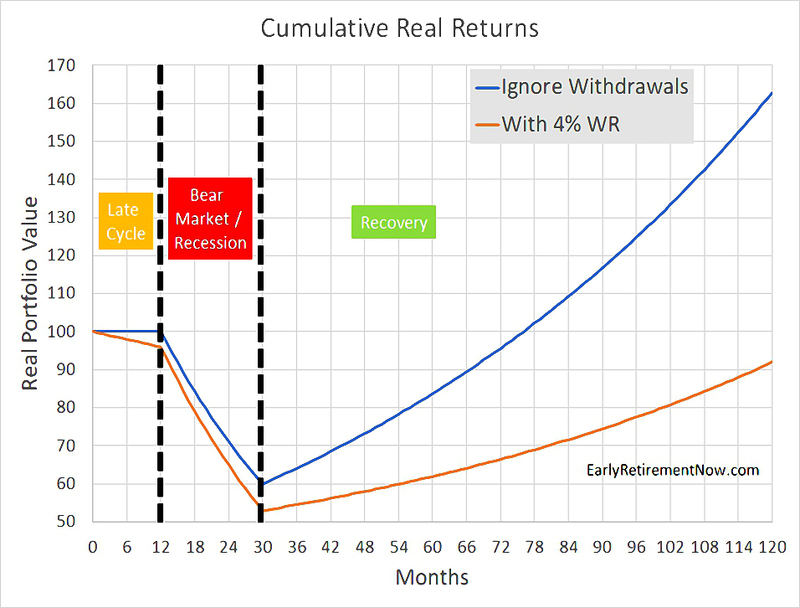 They are interesting as blog posts, but haven’t changed my decumulation strategy. In the upcoming (and hopefully final) post in this series, I really will draw together the lessons from all thirty articles that we’ve looked at. With regards to ERN’s Article 26 and the summary above on Flexibility, ERN and I had a recent discussion on this topic – see later comments to ERN’s SWR post #25 – and concluded that, as modelled by ERN, an individual needs to “find” about 2.5-3.0 times annual consumption of “flexibility” in the form of lower consumption, work or cash buffer. How people come up with it is up to individual preferences. If an individual cannot generate this much “flexibility” then they may well may need to cut back / work for many more years. There are 100 billion stars – fewer than the deficit. They are economical not astronomical numbers.